They are off! The first mailing of the Liberate Your Art 2013 Postcard Swap has been dropped into the post box. With the help of five lovely volunteers, we finished in record time. I’m so grateful for their help! The final number of artist participating this year is 215. 216 if you include me! That’s 1290 pieces of art that will be liberated into the world over the next few weeks. I love this part! 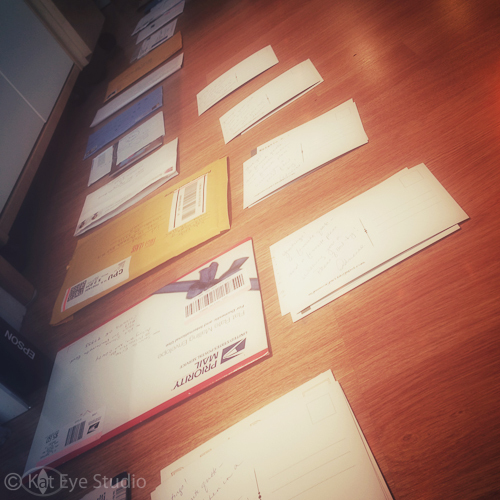 Step 1: Lay out the envelopes (already checked in) with the right mix of US/international so everyone gets one from a country other than their own. Maybe two! 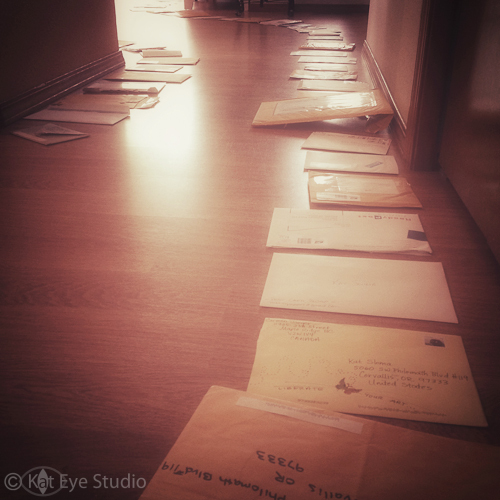 When Step 1 is done, there is a line of envelopes snaking all around my house. In order to keep things organized, our poor dog was relegated to the garage for the day. The postcards would not survive her enthusiasm. 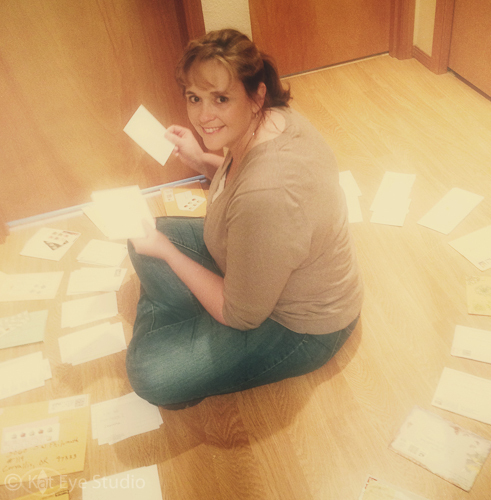 Step 2: Remove postcards from envelopes and distribute them to the five neighbors to the right. Labels and stamps stay with their original envelope. Doing this step right is crucial, or things can get royally messed up. My friend Rainie came earlier than the other volunteers to help me. There would not have been enough room for more than the two of us in some of these tight spaces! The space was a bit tighter than usual, because our family room is blocked off for construction (we are having skylights installed) and all of the family room furniture is squeezed into the bedrooms. 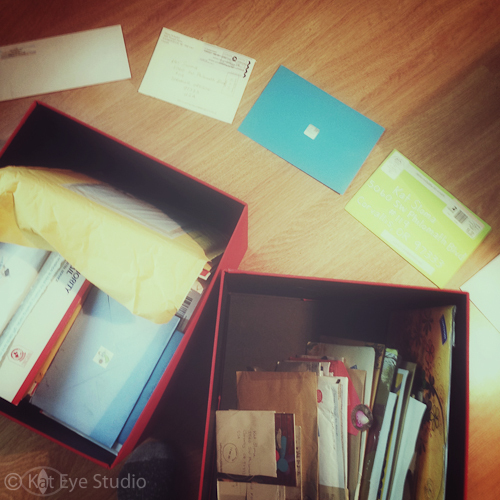 That meant all remaining floorspace in our house was lined with envelopes! 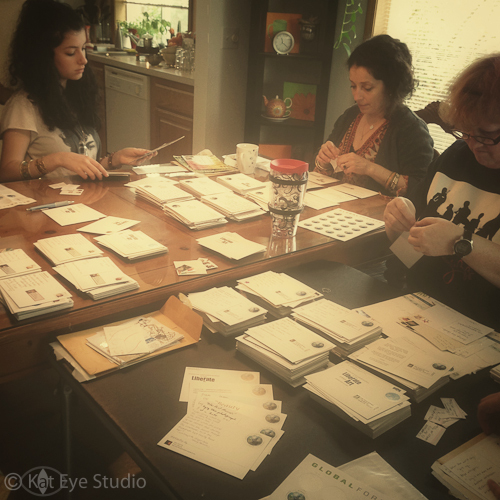 Step 3: The rest of my lovely volunteers arrived ~10am to help with the longest part – sticking on the stamps and labels. After a short training session, they were off and running. 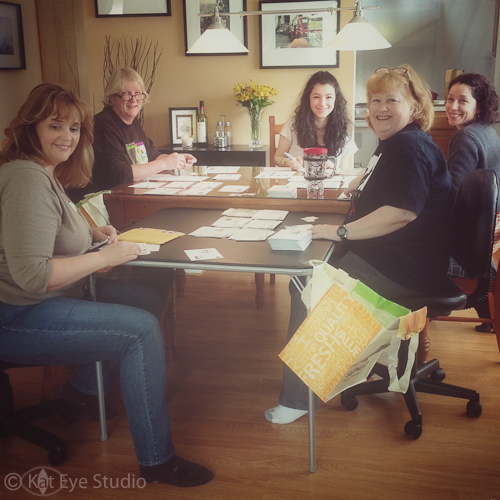 The volunteers (from left to right): Rainie, Jeannette, Iris, KC (front) and Katy. A huge thank you to you all!! In no time at all the finished stacks were growing. Having done most of this myself the last two years (asking my husband to help when he was available), I was amazed at how quickly this went. Right around noon we finished up, which means that about what would have been 12 hours of work on my own was accomplished in 2 hours with the 6 of us working together. The saying “Many hands make light work” is very true! The reward for the volunteers at the end: Looking through the postcards. I know, you probably think that we look at the postcards as we work, but if we stopped to look at the postcards as you stamp and label, we would never get done! So there you have it. Swap Day accomplished in record time, along with a record number of artists participating. The art in the first mailing is liberated. Fly, art, fly! It started with a simple idea: Host a swap to encourage people to create, share and connect through their art. This second year, the Liberate Your Art Postcard Swap just kept getting better and better. The addition of the Facebook Group added a fun, virtual element that went beyond the simple enjoyment of getting real-life mail. I loved seeing the excitement as the postcards were mailed and received. So much art liberated, so many connections made. I have to say, this year’s swap not only met my goal, but exceeded my original vision and delightfully surprised me! From the USA, postcards came from 36 states and territories. Beyond the USA, we had artists from United Kingdom, Canada, Australia, Norway, New Zealand, Germany, Slovenia, The Philippines, Portugal and The Netherlands. Pretty cool, huh? As I laid out the art for the swap, I was incredibly inspired by all of your creativity. I was amazed at the individuality of the art. No two were alike. It made me stop and think about how there are more ways to express our creativity than it is possible to imagine. When we try to define what art is, we limit the possibilities. I was inspired at the last moment to create something special to celebrate. Before I swapped the postcards, I went around and took a photo of one of each participants cards and created this video. Forgive me if the colors are off or if your art is oriented the wrong way, I didn’t have the time on swap day for perfection. There are 193 pieces of art shared in the video, and I think you will be as inspired as I was, seeing all of this art in one place. Thank you, thank you, thank you for an amazing swap this year. Now, let’s finish it off with a bang. It’s time to hop! 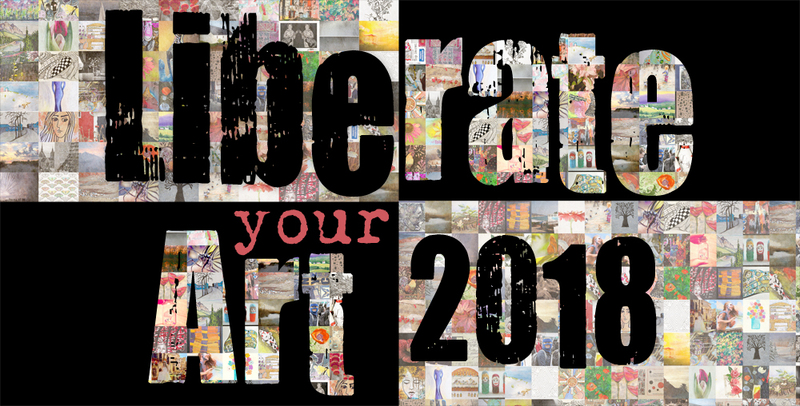 The Liberate Your Art Postcard Swap is Back!! What happens when you create your art? Does it make you happy? Do you find that you have an amazing boost of energy, of insight into life and self? Do you find that you feel centered and grounded, as if some piece of you has been completed for brief moment? I’ve discovered the act of creating, of making art of any kind, can have an amazing and transforming effect on me personally. I know I’m not alone. Now, what happens when you share that art with world? You share a little bit of yourself, and add a little bit of beauty or joy or brightness into someone else’s day. When you share your art, that wonderful energy you gained in the act of creation is not gone, it is magnified. You will see it reflected back to you in different, positive ways. 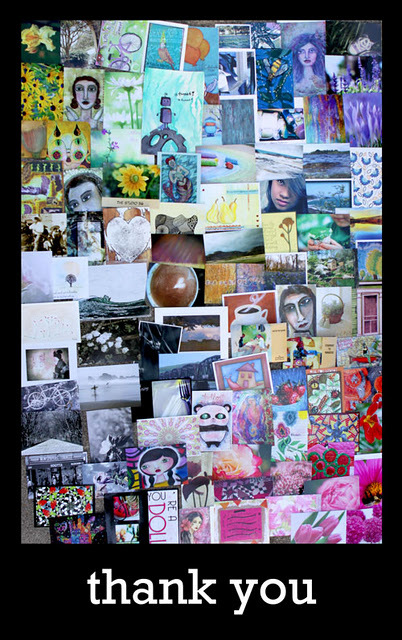 That’s what the Liberate Your Art postcard swap is all about – sharing your art, liberating it out in the world, where it can do its greatest good. 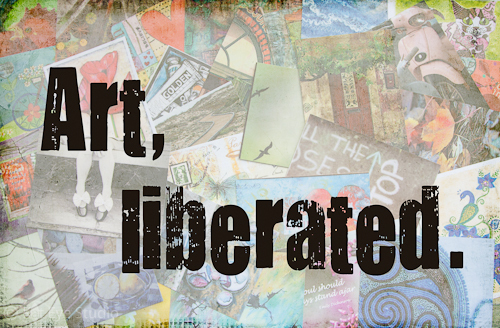 I’m excited to announce the Liberate Your Art swap is back for 2012 and now open for sign up! We had a fabulous time last year, and I’m ready to do it again. I’m hoping to make it even bigger this year! Can you help me reach my goal to beat last year’s number of participants, and share the info about the swap? Blog it, tweet it, post it on your Facebook page. Whatever it takes to get the news out to more artists! Visit the swap page for more information and to sign up for the swap list. After you sign up, you will receive an email with all of the details and lots of support from me to get you started. You’ll be hearing more about the swap here as time goes on, but for now click over here to see what the swap is all about, and join!! 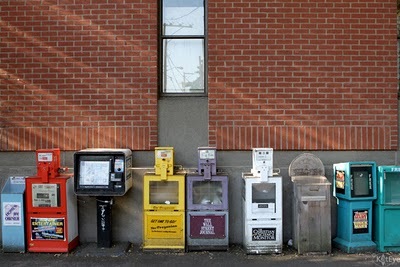 Here we have a row of one of my recent fascinations, newspaper boxes. Some empty and abandoned, others and in use. 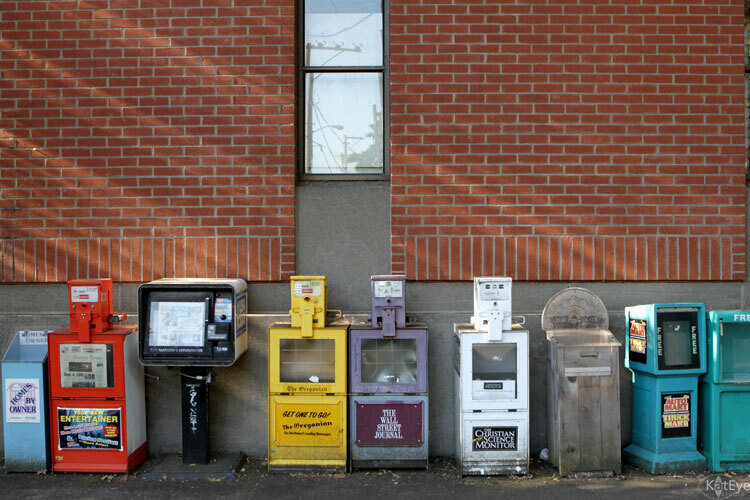 All in a neat row outside of our town’s post office. I loved the light coming along the wall, pointing to the row of these colorful boxes. The Liberate your Art postcard swap had just finished up, and I was contacted by my online friend Elizabeth, from Puerto Rico. Yesterday. The postcards she sent to me in July for the swap arrived in the mail yesterday. Over two months after she had sent them. So I have 5 cheerful postcards that Elizabeth liberated into the world two months ago, now looking for a home! I would like to get some postcards back to Elizabeth too, so if you would like to send Elizabeth one of your postcards, I will send you one of hers. 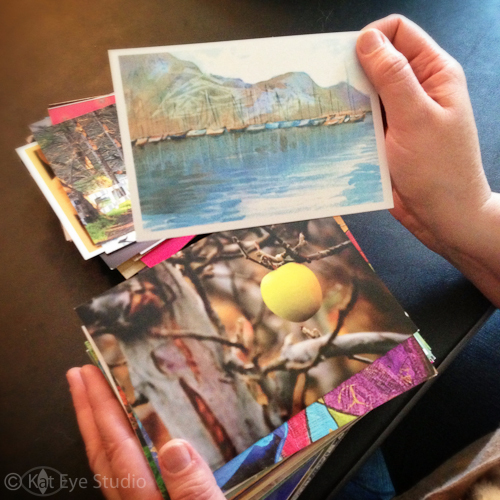 You don’t have to have been a participant in the Liberate your Art postcard swap to do this. Email me kat [at] kateyestudio [dot] com with your interest and I will send you the details. The first five to respond are in! One last participant. A postal mystery that will never be resolved. All I need is a few generous readers to help make Elizabeth’s swap happen! Can you help? The current Exploring with a Camera theme is The Color Wheel: Part 1. Check out the post and join in the exploration. Are you ready to find your own unique vision through photography? This is the last week to register for the fall series of the Find Your Eye e-course. Class starts Sunday, September 25! Visit here for more info. You can subscribe to the Kat Eye News to stay up-to-date on all the happenings around here.